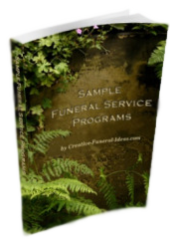 Here is the pdf file for your instructions for your Funeral Program Template. Click “Picture” and then click From File. Inside ; For large photo on left side of program; select “Behind Text” from the Format Picture/Layout box instead of “In Front of Text” AFTER you have moved your large photo in to set it to look ‘layered’. 11.Select the text you want to edit (click on the text box then highlight text). To change text size ; Select the text you want to change. On the Formatting toolbar, type or select point size in the Font Size box. To change text color: Select the text you want to change. On Format toolbar, click the arrow next to Font Color, and select the color you want. TO PRINT: You can take to a print shop or use your own color printer. 8 ½ x 11” paper. Recommend using a heavier paper for best results. Make sure the printer is setup to print in landscape format. 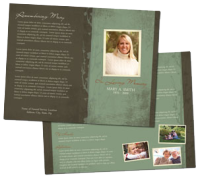 In order to print properly, the OUTSIDE template has to be first, the INSIDE, second. It is recommended to do a test copy first to double check to make sure things are where you want them – text boxes, photos, etc, sometimes get moved around. Additional Tips For resizing your photos; 1.Position the mouse pointer over one of the sizing handles. 2.Drag the sizing handle until the object is the shape and size you want. To maintain picture’s proportions, drag one of the corner sizing handles. Cropping a Picture; 1.Select the photo you want to crop. 2.On the Picture toolbar, click Crop. 3.Position the cropping tool over a cropping handle and drag the handle inward until the object is cropped the way you want it. Changing the Wrapping Style of a Picture: Change the wrapping style of a picture to freely place it on the page and to layer it in front or behind others. Select the graphic you want to change. 1.On the Format menu, click Picture. In the Format Picture dialog box, click the Layout tab. 2.Click ‘In front of text’ as the wrapping style, and then click OK. Move the graphic where you want. Selecting Graphics Placed Behind Other Graphics. Graphics used in the layout file may be layered on top of one another. Click the graphic on top and drag it out of the way to select the graphic behind. Or, change the layer order of the graphic by moving it forward or backward. 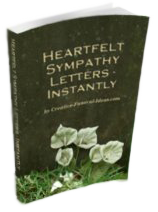 If you want to make your program completely unlike any other, we can provide you with a custom written poem about your loved one. Need any additional help? Contact us below.